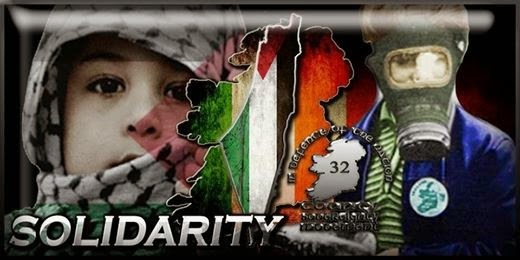 Belfast 32 County Sovereignty Movement: The 32 CSM sends messages of solidarity to Palestine. The 32 CSM sends messages of solidarity to Palestine. The 32 County Sovereignty Movement sends messages of solidarity to our comrades in Palestine. Here in occupied Ireland protests are being organised in support of the people of Gaza as Israel continues its onslaught of genocide against innocent civilians. We question why the international community are standing by with questionable muteness. We question why a people whom were devastated by genocide are now using genocide to eliminate they're neighbours. The international media and world leaders should hang their heads in shame for their deafening silence.